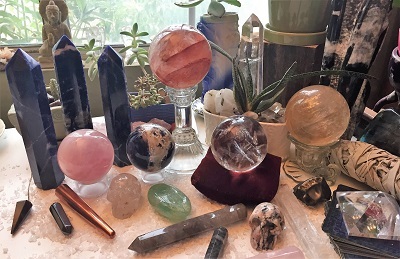 Since ancient times crystal wands, crystal spheres, and pendulums, have been used as tools for connection, communication, divination, dowsing, and holistic healing, by tribal cultures, shamans, healers, energy workers, and metaphysicians. The vibration and resonance of each crystal tool has a different effect on the environment, physical body, aura, and chakras depending on the energetic attributes of the crystal and type of healing tool chosen. Polished Labradorite Sphere with colors of the rainbow and bright flashes of indigo, blue, yellow, green-gold, purple, pink, highly iridescent feldspar from Madagascar, Africa. Gorgeous dusty rose pink with dark grey mottled pattern Polished Rhodonite Crystal Sphere from Madagascar, Africa. Beautiful chocolate brown and black speckled Mahogany Obsidian polished sphere. Beautiful patterned earth toned, white and grey mottled Granite polished Sphere. Beautiful green Chrysoprase polished sphere from Tanzania, Africa. Golden yellow and brownish-black hued Tiger's Eye Polished Tower from South Africa. Shaman’s Horse Totem Crystal Grid is a unique collection of Reiki attuned crystals: Horse Totem, Azurite, Moonstone, Aragonite, and Red Jasper. Flashy color filled Labradorite polished gallet from Madagascar, Africa.